So when is the right time to rebrand a business? Maybe your expanding your product range, diversifying your audience or re-positioning the business into a new market. Or maybe the CEO has just got tired of looking at the same logo and has decided to freshen things up. Whatever the reason, it’s not a decision to be taken lightly. But 13 years after starting out, the world’s oldest and Europe’s largest peer to peer lender have decided to shake things up with the launch of a new brand identity developed in partnership with consultancy firm KBS Albion. 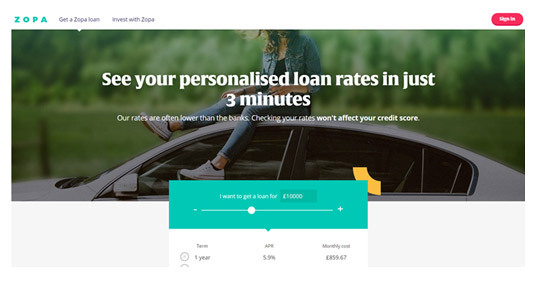 Zopa are hoping that new brand will give it a springboard for its ambitious plans to bring the platform’s products to even more UK customers. A driving force behind changing the face of the business is likely to be a pending application to hold a banking license and we must wait to hear more about that as developments continue. Why would a leading P2P lender want to become a bank? You can find out by reading Neil Edwards previous post on the subject. So how can we assess Zopa’s new identity from the new website? It’s very easy to make a quick subjective judgement, but it’s impossible to truly judge the new brand until you see the long-term impact of that visual identity on their business over a period of time. It would also be useful to have gained a fuller insight into their brand vision and values beyond the brief press release on the subject. So what do Zopa stand for? Well, interestingly the acronym influenced name ZOPA stands for “zone of possible agreement“, a negotiating term identifying the bounds within which agreement can be reached between two parties. In the recent release introducing the new brand identity, Zopa comment. Here’s a classic example of a business stating universal business values – what company would not want to adhere to the goals outlined in this statement? What they need in there is something that truly resonates as a differentiating value. Here’s an example of some brand value which really do stand out for being different. And it’s from Google. It’s one of the most talked about brand values I can remember because it’s contentious, bold and brave. Can you imagine a mainstream bank having a brand value like that. And maybe that’s the point – Zopa are repositioning themselves to be set apart from the AlfFin challengers. Perhaps Zopa now want to be positioned as the mainstream along with some of the benefits that an everyday bank can offer. 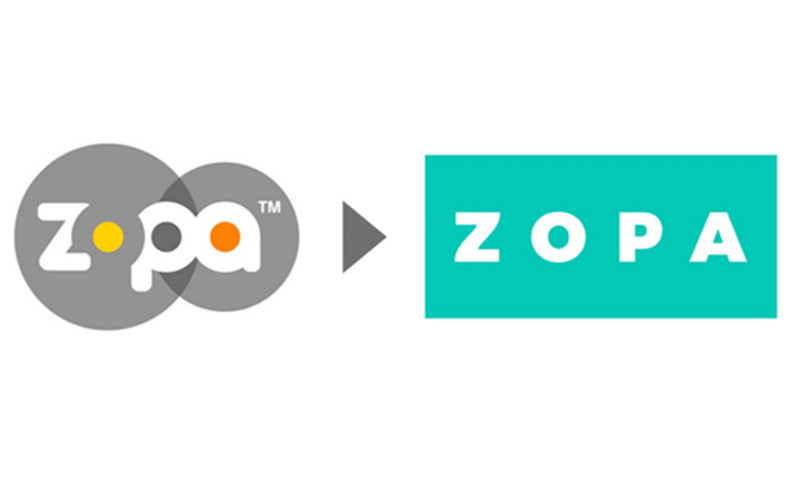 So, what can we say about the new brand for Zopa as a visual identity. Well, I have to be honest, and maybe I should say this quietly… I actually quite liked the old identity. I liked the two interlocking circles and the fact that it didn’t look like a bank. It certainly fitted perfectly with the genesis of the brand name. However, one of the problems with the old identity was that whilst the brandmark was strong, often the supporting communication’s looked varied in quality and lacking in continuity. The new identity looks more fully formed, has a stronger palette and some funky iconography to help support key service offerings. Tightly cropped photography also work to give a personable tone and feel making the website feel more lifestyle orientated than the previous incarnation. The use of an untypical bold headline font help to give the brand a bit of personality too. But the boxed brandmark itself looks like many other identities without any real defining features, apart from the name itself. “There is a certain blandness to the new identity. It is simple and confident, but not terribly distinctive. In this respect, it calls to mind lots of other current brands – Zara, Sony, Nokia, to name a few. But isn’t that the whole point? 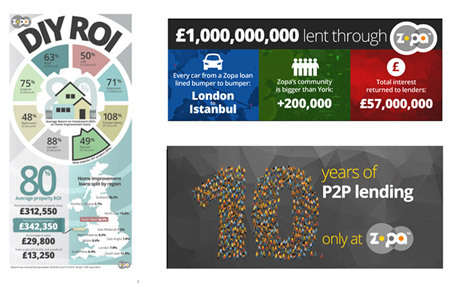 On one hand Zopa is ‘the pioneer of peer to peer lending’ and has tried hard over the years to accentuate its difference, but on the other hand Zopa wants to be seen as trustworthy and widely accepted. Time will tell if it truly resonates with a wider audience unconcerned about whether that are part of the Altfin community or not and more interested in the quality of products and services that they offer.